W. Bro. Roy Peter was initiated into the mysteries and privileges of freemasonry in Lodge Trivandrum No. 168 on the April 21, 2001. He was passed on October 21, 2001 and raised on March 04, 2002. W. Bro. Roy Peter has held various offices of the Lodge and was elected to the Eastern Chair while he was serving the Lodge as its Senior Warden. 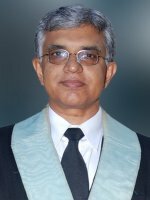 He was installed as the 46th Master of Lodge Trivandrum on January 16, 2010. W. Bro. Roy Peter has keenly participated in ritual working competitions. He was awarded certificates of merit for his performance as Junior Deacon, for explanation of tracing boards and for delivering charge after initiation. Born on June 07, 1959, W. Bro. Roy Peter did his schooling in Sainik School, Trivandrum. He was a house captain and took keen interest in sports and games. He participated in the Republic Day Parade at New Delhi in the year 1975 as an NCC cadet. After finishing schooling in the year 1969, he joined Regional Engineering College, Tiruchirapalli where he did his Bachelor of Engineering in Mechanical Engineering. He completed his Engineering in the year 1981. He was then selected for a 2 year Post Graduate Diploma Programme in Industrial Engineering at National Institute for Training in Industrial Engineering (NITIE), Bombay. On completion of post graduation in Industrial Management in the year 1983, he worked for two years as a Management Consultant with S.B. Billimoria and Co. at Bombay. Later, he worked as a Software Consultant with Tata Burroughs Ltd for five years when he travelled extensively in the U.S. on assignments. W. Bro. Roy Peter returned to his native land in 1991 due to personal commitments. He started Prime Property Developers, which is a family owned partnership firm, undertaking real estate development projects. Prime Property Developers have undertaken several landmark apartment projects in Trivandrum. Over the years, the firm has built a formidable reputation as a reliable and quality developer. W. Bro. Roy Peter was a member of Trivandrum Round Table -66 and was the Chairman of the Table in the year 1998-99. He is a keen golfer and is a member of the Golf Addicts Society of Southern India. He is currently the President of the Trivandrum Chapter of Confederation of Real Estate Developers Associations of India (CREDAI). W. Bro. Roy Peter is married to Preetha Roy, who is an Engineer and MBA and is an active partner in the firm. They are blessed with two children, Peter and Isaac.